Tamara Keith Tamara Keith is a NPR White House Correspondent. Tamara Keith covers business for NPR. April 18, 2019  The Justice Department will release a redacted version of special counsel Robert Mueller's report Thursday. While it's likely to shed light on some big open questions, it could also raise others. April 17, 2019  The Justice Department is expected to release a redacted version of the Mueller report on Thursday. President Trump isn't waiting for that release to claim total exoneration. April 9, 2019  It's still very early in the Democratic presidential primary process. Young Democrats in Iowa tell us what they want in their 2020 presidential candidate. The conversation yielded some surprises. April 4, 2019  President Trump has declared the Russia "witch hunt" dead and the "collusion delusion" over. His narrative hasn't budged even though special counsel Robert Mueller's report has yet to be released. April 3, 2019  President Trump is touting his deal to replace the North American Free Trade Agreement. But Congress hasn't approved that deal, and it's unclear if the White House has a strategy to get that done. April 1, 2019  The former vice president is accused of acting inappropriately when he kissed the back of a former Nevada Democratic assemblywoman's head at a campaign event in 2014. March 29, 2019  In Michigan, President Trump held his first rally since the end of the Mueller investigation. Also, the latest on Venezuelans fleeing to Colombia and Brexit turmoil. 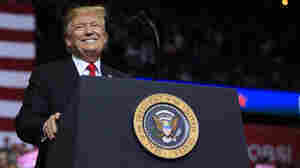 March 29, 2019  President Trump held a rally in Michigan Thursday night, his first since the investigation by special counsel Robert Mueller finished. March 28, 2019  In a wide-ranging speech, the president touched on the recently completed Mueller investigation, but also on health care, the Green New Deal and immigration. March 25, 2019  President Trump sees vindication in the attorney general's conclusions on the Mueller report. How will that translate to his re-election bid, and what will his legal strategy be moving forward? March 23, 2019  Special Counsel Robert Mueller has wrapped up a nearly two-year investigation of the president's campaign and possible ties to Russia, a line of inquiry that goes back even further. March 22, 2019  The White House is saying little about special counsel Robert Mueller submitting his report to the attorney general, ending his probe. President Trump has previously called it a witch hunt. March 22, 2019  Special Counsel Robert Mueller has delivered his report to the attorney general. It is not known what's in that report, but much of what Mueller has done has already been made public. March 22, 2019  House Democrats raise concerns over Jared Kushner and other administration officials using personal accounts to conduct White House business. Rep. Elijah Cummings says Kushner has relied on WhatsApp. March 20, 2019  President Trump is in Ohio touting the growth in manufacturing jobs during his presidency. At the same time, he is fighting with General Motors over its closure of a plant in Lordstown, Ohio.